Mrs. Lura McElwee Wolfe, age 89, of Cedartown, GA passed away Monday, October 30, 2017. She was born in Cedartown, GA on October 6, 1928, a daughter of the late Levi Franklin Jameson and Lillie Thompson Jameson. 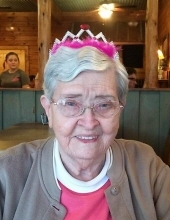 Mrs. Wolfe lived all of her life in Cedartown where she was a member of Friendly Baptist Church, and also served as choir director for East View Baptist Church for several years. She spent her working career in retail for over forty years. She never met a stranger and was always talking. In addition to her parents she was preceded in death by her brothers and sisters: L.C. Jameson, Learon Jameson, Loris Jameson, Lottie Brown, Lillian Whitaker and Leo Tarvar. Survivors include her son, Tim McElwee and his wife Jill; daughter, Adonna Puckett and her husband Gary; six grandchildren: Cory Puckett, Kyle Puckett, Jessie Puckett, Casen McElwee, Brody McElwee and Josh Hunter; two great grandchildren: Gavin Puckett and Shelbee Puckett; a number of nieces and nephews also survive. Funeral services will be held Wednesday, November 1, 2017 at 2:00 PM in the chapel of the Smith & Miller Funeral Home with Rev. Jesse Starnes officiating. Interment will follow in the Northview Cemetery with Rev. Bray Allen officiating. Pallbearers will include: Brody McElwee, Cory Puckett, Tony McElwee, Jamie Guice, James Guice and Zach Sanders. The Smith & Miller Funeral Home is honored to serve the family of Mrs. Lura McElwee Wolfe. To send flowers or a remembrance gift to the family of Lura McElwee Wolfe, please visit our Tribute Store. "Email Address" would like to share the life celebration of Lura McElwee Wolfe. Click on the "link" to go to share a favorite memory or leave a condolence message for the family.